Why do life-saving prescription drugs cost so much? Drug companies insist that prices reflect the millions they invest in research and development. 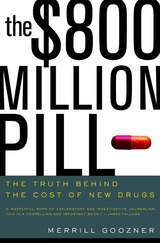 In this gripping exposé, Merrill Goozner contends that American taxpayers are in fact footing the bill twice: once by supporting government-funded research and again by paying astronomically high prices for prescription drugs. Goozner demonstrates that almost all the important new drugs of the past quarter-century actually originated from research at taxpayer-funded universities and at the National Institutes of Health. He reports that once the innovative work is over, the pharmaceutical industry often steps in to reap the profit. Goozner shows how drug innovation is driven by dedicated scientists intent on finding cures for diseases, not by pharmaceutical firms whose bottom line often takes precedence over the advance of medicine. A university biochemist who spent twenty years searching for a single blood protein that later became the best-selling biotech drug in the world, a government employee who discovered the causes for dozens of crippling genetic disorders, and the Department of Energy-funded research that made the Human Genome Project possible--these engrossing accounts illustrate how medical breakthroughs actually take place. The $800 Million Pill suggests ways that the government's role in testing new medicines could be expanded to eliminate the private sector waste driving up the cost of existing drugs. Pharmaceutical firms should be compelled to refocus their human and financial resources on true medical innovation, Goozner insists. This book is essential reading for everyone concerned about the politically charged topics of drug pricing, Medicare coverage, national health care, and the role of pharmaceutical companies in developing countries. Merrill Goozner is former Chief Economics Correspondent at the Chicago Tribune. Winner of six Peter Lisagor Awards, Goozner is a contributing editor for The American Prospect. His work has also appeared in the New York Times, Washington Post, Boston Magazine, Columbia Journalism Review, Washington Monthly, Fortune Small Business, Slate.com, and Salon.com, among other publications.